Time has slipped by and I just don’t seem ever to be able to get around to posting my Swiss journal notes. So, maybe I should just go back to keeping you up to date on the happenings in the Marks household. 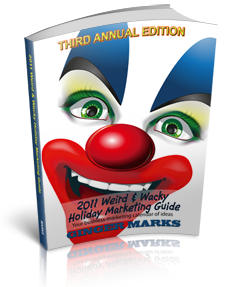 2011 is almost here and I am feverishly working on the Amazon launch of my third edition Weird & Wacky Holiday Marketing Guide. Currently I am seeking those who would be willing to help by donating and promoting the launch. If you are interested just let me know. I would be happy to welcome your support.